The Special Purpose Unit (SPU) under the National Industrial & Commercial Investments Limited (NICIL), today announced that 100 cane cutters were contracted to harvest sugar cane that is in the field at the former GuySuCo Rose Hall Estate. Rose Hall is one of the estates shuttered by GuySuCo Management at the end of 2017 and handed over to the SPU for privatization and/or diversification. Initial SPU surveys revealed that GuySuCo had left a sugarcane crop in the ground that was going to be ready for harvesting. “The sugarcane in the ground at Rose Hall represented significant value that would be lost if not harvested. 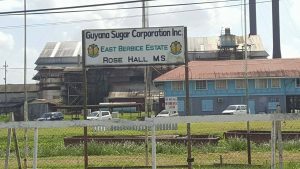 The sugarcane at Rose Hall also represented an opportunity for the SPU to produce molasses to help meet local demand in 2018,” the SPU said. Demerara Distillers Limited has said that it needed more molasses to produce more rum for its booming overseas market. The Rose Hall estate also has 4,300 hectares of sugarcane in the field for the second crop in 2018.